Home → Chemicals → Hillyard, Arsenal One, Neutralizer #18, Dilution Control, HIL0081825, Four 2.5 liter bottles per case, sold as One 2.5 liter bottle. 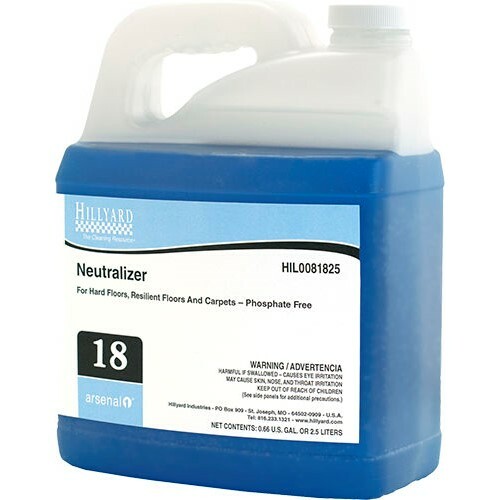 Neutralizer is a high quality neutralizer and conditioner formulated to help eliminate alkaline residues on floors. On resilient and hard floors, its special chelating action ties up the insoluble alkaline salts left behind by alkaline strippers that can case floor finishes to powder or wear poorly. Neutralizer allows stripper residue to be quickly and easily removed. Its labor-saving formula eliminates multiple rinsing steps. Allows stripper residue to be quickly and easily removed. Labor-saving formula eliminates multiple rinsing steps. Works equally well on carpets! Dilution rate 2 oz per gallon. Allows stripper residue to be quickly and easily removed. Labor-saving formula eliminates multiple rinsing steps. Works equally well on carpets! Case Specs: Four 2.5 liter containers per case, sold as one 2.5 liter container.